To understand the chronological succession of product designs and technical improvements introduced in the basic LEGO construction elements, they have to be considered in their whole, as well as the causes (marketing targets or other) and eventually the consequences of each step taken. As a company that manufactured plastic toys (the other branches are not relevant here), LEGO made periodical investments in molds. New molds might be required because the old ones were worn out, because it was necessary to increase the output, or because of some former technical limitation that had to be overcome- these are not always self-evident. The full-bodied studs, for instance, were incompatible with shorter injection cycles, because the mold opened too soon and the stud body, still soft, would cause the surface to cave-in. Thus, hollow studs became a must once new, faster, injection equipment became available in the mid 1950s. New molds were also required for any new parts and components. Molds were machined in steel and then hardened to increase their life. Once hardened, a reworking of the surface would be very expensive; in some cases practically impossible. This text proposes an approach to the study of the early evolution of the LEGO bricks based in cycles of innovation/investment, their presumed causes and verifiable consequences. In particular we shall consider contemporary molds of the 2X4 and 2X2 brick types, the only ones to have been part of the original construction system. Considering that each cycle has some technological markers, not always apparent, when one of its products is dated, all molds pertaining to the same investment cycle will, in all likelihood, be contemporary. And thus a timeline of early LEGO development can be drawn. 1949- "let's try this one"
LEGO, a small Danish family company has taken a timely decision to invest in plastic injection equipment and start exploring the technology for toy manufacturing. One of their early products was an almost exact copy of the Self-locking building bricks patented in the United Kingdom, France and Switzerland and manufactured by Kiddicraft of England. I discuss the Kiddicraft product elsewhere (here, if you care to read) - they are the brainchild of Hilary Page, a brilliant inventor and seemingly a selfless man but, as an industrial product, it was neither promising, nor the true foundation of the greatness of LEGO. During the 1930s several companies manufactured construction toys based in bricks (of rubber, wood, ceramics...) without particular success. Using a thermoset plastic, Page went a step further- he developed a product that was light, attractively coloured, and whose elements could lock one to the other through the elasticity of the material. But many other companies would in time present similar systems to the market and they came and went without people even remembering their name today, including Kiddicraft whose main claim to fame is, ironically and certainly unfairly, its role in the origin of LEGO. Would LEGO exist if not for Kiddicraft? Probably not. Could Kiddicraft have become what LEGO is today, if not for LEGO? Most certainly not! So, LEGO invested in molds and started injecting plastic in the shape of 2x4 and 2x2 slotted bricks with full studs, one type of doors and three types of windows, all clones of the Kiddicraft product. Because the slots were molded and not machine-cut into the finished brick, the initial mold for the 2X4 brick manufactured at least three double slotted bricks and two single slotted bricks in each injection cycle, while the 2X2 mold manufactured at least two single slotted and two double slotted bricks in each cycle, as can be seen from the position of the pips and the ratio of brick types in an early box. Those were 2X4vs01 and 2X2vs01. At this point LEGO introduced some creativity, not to the product, but to the packaging. The bricks were manufactured in an attractive thermoset of striking colours and packed in no less attractive boxes (good taste in packaging was a trademark of LEGO) in a way that used the contrasting colours of the bricks to the best advantage (the system was so successful that it would be used for two decades). Also they did not rely in card roofs as Kiddicraft, but expected users to make roofs from the bricks themselves. BUT neither bricks or boxes were marked with the LEGO logo, which is astonishing because the wooden toys of that time were marked and LEGO seemed particularly proud of its products. Can that be a consequence of the Kiddicraft connection and a recognition that the product was not really their own? Or, more likely, a decision to sell the toy as a "white product" that each major outlet could mark with their own name ("GEAS" and "Primo" were used in Sweden)? Or could the product be a joint-venture with another company? I wonder... But either way it seemingly demonstrates that the product was not considered promising enough to be worth of brand recognition at all costs. Some of the early bricks were manufactured in an expensive plastic that shows marked transparency to the light in any colour. Those bricks are very rare today, revealing small runs. 1952/53- In the market to stay! In 1952 or 1953 a decision was taken to invest in the LEGO toy construction product. The decision followed two lines: brand recognition- all products were marked with "LEGO" in block letters (this called for new molds, even for the brick types already produced and thus were introduced 2X4vs02 and 2X2vs02 - but seemingly the old molds have not been retired at this time); and diversification- 2X3vs01 and 1X2vs01 bricks were introduced at this time and new slot arrangements were made available to the 2X4 and 2X2 bricks, calling for more expensive molds. A thicker, more stable baseplate (10X20vs02) was also introduced at this time- it would constitute one of LEGO's mainstays in the future. It too was marked "LEGO". Actually LEGO was now so eager to mark their products that some molds were remachined to make the brand name more visible. This was a defensive measure against manufacturers of cheaper lookalikes of the non-patented LEGO bricks that had been selling in the Danish market. The fact that the product had become a target for imitators shows that sales had increased to a level that attracted competitors. In this investment cycle, newly designed boxes were also introduced. The decisions taken at this time did not cause a surge of the product itself - it remained basically the same - but they are a statement that sales showed promise and the producer decided that the construction toy was to stay in the market. 1954/55- The LEGO System i leg: in the market to win! In 1954 started the investment cycle that would be capital to LEGO. It started rather inauspiciously with the introduction of the little-used 4X4 corner brick, the prone-to-bend 2X8, 2X10, 2X12 and 2X14 beams and the large and rather clumsy "windows with glass". A little remarked but highly meaningful detail was the rethinking of the 700/ boxed sets. Until 1953 they were just an amassment of bricks and windows in up to five colours, sold with a leaflet with loose construction ideas, most of which required multiple boxes to be achievable. But now the number of available colours started being reduced until only building-like white and red would remain and each set now carried enough material for a specific building, illustrated in the leaflet that went in each box. LEGO stylized its brand recognition mark in 1954, introducing the so-called "dogbone logo" in its bricks. All new molds were now machined to print the logo underneath the brick. So were 2X4vs03, 2X2vs03, and the new thick 10X20 baseplate. 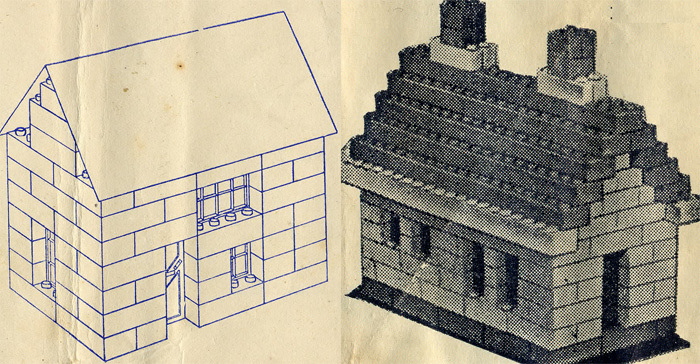 During 1954 the company thought of a new side of the building toy that called for small bricks- this was LEGO MOSAIK, a short-lived mosaic builder that relied on 1X1 round and square bricks as well as 1X2 square and round bricks (known in the hobby as "macaroni"). The 1X1 bricks, that seemed yet out of context in the frame of a system based on a 2X4 brick module, were perfect for the Mosaik system. But they had to be branded to raise barriers against likely competitors. They were too small to be branded in the interior and the only part exposed in a built mosaic was the top and thus they were the first parts to be marked on top their studs. At the same time new molds were made so that the other bricks on which the Mosaik system relied were also branded on the stud tops. These were 1X2vs03 and vs02 of the macaroni bricks. The studs were still full bodied, but new, presumably faster, injection machinery was now available and seemingly it was used in the new 1X1square and 1X2vs03 bricks. But the faster cycle brought a displeasing result: the stud surfaces caved in and looked bad! Oh well, it had to do for now! In 1955 the investment cycle was beautifully completed and it should go in marketing manuals as one of the most unexpected blueprints for success in the toy industry. LEGO was building not a collection of brick types, as several other brands had, but a whole play-system: on sale went the thin plates, that could be used as both bases and elegant modernist roofs; and low and elegant windows and doors, showing that the scale of the system had changed- for all practical effects the 1X2 brick would henceforward be the modular basis and thin-walled buildings could be convenient scaled to the proportions of the 1:87 vehicles also being launched at the time; and 1X6 and 1X8 beams, that served as lintels over the windows and aggregating elements of the new walls. And it is revealing that the image of a growing Kjeld Christiansen, one of the founder's grandchildren, could be used over the years to illustrate LEGO boxed sets- the toy was growing with him and being retargeted for the older child. But all this construction-toy paraphernalia could not be conveniently sold in the large boxes of brick assortments, neither could it be sold in units. And so LEGO developed a scheme already tried with the windows: low cost, attractively designed, numbered "matchboxes" in which all accessories, as well as small quantities of bricks, could be bought. These relatively inexpensive parts boxes, attractively displayed in stands or rotators, became the ideal gift for a little boy to beg his parents when the family went to the Magasins du Nord, or for a visiting couple to soothe the dear children of the hosts. This was, to my knowledge, a rather new concept in the field- one that would be copied by all competitors - the sincerest recognition of an idea's worth. But this was still not all for this year of all years: LEGO launched two new concepts - the City Plan, a plastic or cardboard plant with streets, grass spots and lots where LEGO buildings could be placed to make up a whole neighbourhood; and set boxes with all the material needed to construct a building to fill a vacant lot. As we remarked above, the concept of a "building in a box" had already been introduced for 1954 in the 700/ sets, but now four of the small "matchbox" accessory sets allowed the construction of so many miniature houses, with their own place in the City Plan. And then there was the new (1236) set, consisting of the full complement of material to build a garage (for the Plan, of course). This was LEGO's "System i leg"- the "System in play", an integrated concept where the building bricks were not the main product bur rather a piece of a toy puzzle that would be constructed by the child to the limits of his imagination and the means of his parents to increase the collection of available bricks, vehicles and complementing items. Actually, many a child wanted to have a full collection of supplemental boxes because they made up a numbered array, irrespective of the utility of the contents... I know because I was one of those children! Times must have been hectic at LEGO in 1956. Now that they had a really promising product, it had to be sold so as to get hold of a share of the market before competitors could follow suit. In 1956 started the first export to non-Scandinavian countries (Germany and Holland) and other interested partners started queuing, including a representative in faraway Portugal. With the opening of the foreign markets, the sky was the limit for LEGO if they played it right. This was not a time for substantial investment in new items- it was a time for devising new attractive ways to offer the existing system and a time to solve technical problems, albeit minor. The fulfillment of hopes in the foreign markets might depend on it, especially in Germany where technically minded competitors might explore the deficiencies of the system. On the news side, 1956 saw the introduction of a set (1310) in the spirit of the garage of 1955- it was a beautiful Art Deco Esso Service Station including, this time, bricks, accessories and a vehicle. The expanding foreign markets called for new molds to increase the output and it was the time to modernize the System and correct the problems that limited the production speed. A new set of molds was prepared and the bricks they produced were no longer slotted. At the same time new doors and windows with studs were introduced, that improved the system- now these elements were no more than shaped bricks. Thus came to be 1X2vs04, 2X2vs04, 2X3vs05 and 2X4vs04. They all had in common the hollowing of the studs by a circa 3mm cylindrical opening that avoided the caving-in of the surface in fast cycles. At the same time the 2X4, 2X3 and 2X4 bricks had the LEGO logo marked on the studs, as had the 1X2 and 1X1 back in 1954/55. But there was a more grievous issue with the LEGO system, which the 1956 versions, very rigid and with a tendency to warp, had only more plainly brought to attention. And that was the lack of a wholly positive connection between bricks - very often connected bricks only stayed united by gravity or after a thin plate effectively "closed" the top of the structure, making it rigid. Solution: design of tubular connectors for the 2X4, 2X3 and 2X2 bricks where the problem was more acute and easier to tackle. LEGO developed a tubular connector that solved the problem and versions 2X4vs05, 2X3vs06 and 2X2vs05 substituted the versions of only a year ago in the esteemed foreign markets, while apparently the remaining stocks were drained by the home market. But the introduction of the tubular connectors was much more relevant than just solving a problem. Actually the patent for the positive connection of plastic toy bricks, a world-first, would both liberate LEGO from the ever-present ghost of its Kiddicraft ancestry, and provide a legal ground in the future for shooing competitors with the perspective of a patent infringement lawsuit. ca 1960 This time we'll do it right! A small problem was corrected in the next molding cycle- and it is well because it allows for a simple way to date bricks. The original 3mm stud hollow proved too large and the stud wall ended up being too thin for a brand that aimed at perfection. In some bricks stud walls are sometimes found broken, others may break when played rough. But most important and unapparent to buyers, factory rejects were probably much higher than need be. When the time came to prepare new molds, the hollow was decreased to circa 2mm and the bricks are clearly distinguishable. For 2X4 and 2X2, the two brick types that carried the brand colours from the onset (even when they did not actually carry its name) this was the sixth version; for LEGO this was also the sixth mold investment cycle; for me this is the end of the timeline. - ABB boxed 700/ sets with a selection of coloured bricks for construction at a circa 1:60 scale aimed at young children (LEGO name not associated with box or bricks). - ABB 700/ boxes exterior redesigned, now including LEGO name. - 2X3 and 1X2 bricks and 10X20 thick baseplate added to the system; new slot positions at 3 and 9 o'clock in 2X4 and 2X2. - 1X1 bricks launched that with 1X2vs03 and 1X2 and 1X4 "macaroni" are the first to have the LEGO name on the studs to be used with LEGO Mosaik. - Boxed sets with all material for a specific building- 1236 garage and four small houses. - Bricks with connecting tubes patented and sold (2X4vs05 and 2X2vs05).